On Tuesday, the Mariners’ made headlines when Jeff Passan of Yahoo Sports reported that Jerry Dipoto and the Mariners were considering a “full-fledged teardown” this offseason. The M’s were competitive during the 2018 season, winning 89 games, but that was only good for third place in the stacked American League West. Rather than settling for mediocrity, it looks like Dipoto and his associates are facing some critical questions about the direction of their club’s future. The Mariners already got the action started by dealing Mike Zunino and Guillermo Heredia to the Rays for Mallex Smith and Jake Fraley on Thursday. Given Dipoto’s track record and penchant for wheeling and dealing, this is likely the first of many trades that are going to come. Aside from Edwin Diaz, Mitch Haniger and Marco Gonzales, everyone on the Mariners is believed to be available for the right price. 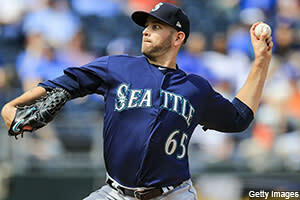 The top trade chip in the group has to be star southpaw James Paxton. The oft-injured 30-year-old southpaw is coming off one of the finest seasons of his career, compiling a 3.76 ERA, 1.10 WHIP and 208/42 K/BB ratio across a career-high 160 ⅓ innings. Ken Rosenthal of The Athletic reported Friday that the Yankees are one of the teams that has discussed a Paxton trade with the Mariners already. The Yankees are exploring every possible avenue for upgrades to their starting rotation, but with two years of team control left on Paxton the price via trade is sure to be steep. The Yankees aren’t the only American League power vying for the left-hander’s services though. On Sunday, Rosenthal added that the Astros are also talking to the Mariners about a deal for Paxton. Given the depth and strength that the Astros already possess in their starting rotation, adding Paxton seems like a luxury move, but keeping him away from the Yankees and other American League contenders would be wise. Rosenthal described the market for Paxon as “active” and it’s starting to look as though it’s a question of when, rather than if, he’ll be traded. Expect Paxton to be donning a new uniform the next time that he takes the hill. Could an addition of Bryce Harper have pushed the Astros over the top and allowed them to repeat as World Series Champions in 2018? It sounds like the Astros thought so, and even had a deal in place to acquire the six-time All-Star and former National League MVP from the Nationals prior to the trade deadline. According to Ken Rosenthal of The Athletic, the two clubs had agreed to a deal that would have sent a package of prospects to the Nationals that included starting pitcher J.B. Bukauskas and catcher Garrett Stubbs. The trade was vetoed by Nationals’ ownership. The Nationals were only 5 1/2 games out of first place at the time and ownership still wanted to go for it. The package seems quite a bit lighter than the Orioles received from the Dodgers in the Manny Machado trade two weeks earlier and that may have been a deciding factor from the Nationals’ perspective on why the trade was ultimately not completed. Still, it’s interesting to ponder whether or not the addition of Harper could have pushed the the Astros over the top and past the Red Sox in the ALCS. It’s also fair to wonder if the Astros still have interest in Harper’s services now that he’s a free agent. If he’s looking to play for a ready-made World Series contender, there aren’t many landing spots that would be better than Houston. As of now, the Phillies are considered the front-runner to land Harper, though there are likely plenty of teams lurking in the shadows waiting to strike here. American League Quick Hits: Astros’ shortstop Carlos Correa underwent surgery last week to repair a deviated septum. Correa is hopeful that this will correct the breathing issues he dealt with during the season. He’s expected to resume his normal offseason workouts by next weekend… Jose Altuve (knee) said Sunday that doctors have told him he’s “going to be 120 percent for the first day of spring training.” Altuve had surgery last month to repair an avulsion fracture in his right knee, an ailment that plagued him down the stretch of the regular season and playoffs. However, it sounds like the recovery process will be relatively quick and he shouldn’t be limited much, if at all, in spring training… Orioles’ left-hander Richard Bleier (lat) has begun his throwing program and is on track to be ready for the start of the season… Greg Johns of MLB.com reports the Mariners will likely have to trade for a catcher to replace the departed Mike Zunino, who was dealt to the Rays on Thursday… Athletics’ general manager David Forst indicated that his top offseason priorities are to re-sign their own free agents and to fill out their starting rotation.. Matt Chapman was announced as the Rawlings Platinum Glove winner in the American League…Joe Mauer officially announced his retirement from Major League Baseball on Friday after 15 seasons. Mauer indicated that the decision came down to his health and his family, explaining that the risk of another concussion was too great and that his desire to play was outweighed by the possibility of another injury… The Mariners’ inked Dylan Moore to a major league contract. He’ll compete for a utility role on the M’s Opening Day bench… Jon Heyman of Fancred reports that the Yankees met with the Indians about Corey Kluber and Carlos Carrasco at the General Manager Meetings. National League Quick Hits: Mark Bowman of MLB.com reported that the Braves are interested in free agents Michael Brantley and Wilson Ramos. There have been rumblings that both could be considered top targets of the organization this offseason… Nolan Arenado was announced as the Rawlings Platinum Glove winner in the National League for the second consecutive season… Quintin Berry announced his retirement and took a job as the Brewers’ outfield and baserunning coordinator… The Dodgers granted Chase Utley his release, paving the way for the veteran infielder to retire… Jon Heyman of Fancred reports that the Mets “are expected to investigate” a possible trade for J.T. Realmuto.